There was nothing to see of the penumbral lunar eclipse up here in Scotland. By the time the moon had risen over the hill behind the house, it had been over for a couple of hours. Pity! Undeterred, I carried out the Lunar Eclipse Spread from the other day, using my beloved DruidCraft. Who was hidden in the shadow of the world? The Hermit. I like this card, but it’s not something that comes up for me much in readings. I don’t feel as though I’m much of a hermit! I love how his face is in shadow here and he holds his light up as much to show others the way as to light his own path. Heck, his own eyes could be closed! In his lantern sits, I fancy, The Star. She offers us hope, guidance and ambitions…. how interesting! We also see the crescent of a waning moon – something is ending – perhaps the Hermit’s lonely sojourn up there in the mountains? The dawn breaks on the horizon, emphasising the start of something new, a new day – new opportunities. Of course, it could just as easily be a sunset! Either way, we have the idea of something drawing to a close. The light gleams upon a distant river that twists like a lightening bolt through the landscape. For me, water in the Tarot represents the subconscious and this is no still pool – this is moving water; Something Is Happening. Yikes! The staff that he leans upon reminds me of The Fool, HE stepped off the cliff to start his journey. Our Hermit will wend his way back down into the bosom of humanity via the easier route, the path. I wonder whether The Hermit created that path – cutting a path isn’t easy! But then, when you’ve got the energy of the Wands at your disposal (as in his walking staff), anything is possible! 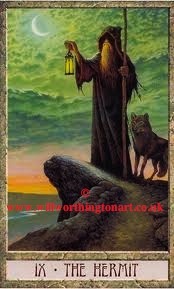 And the Hermit’s four-legged companion, the wolf – what will become of him? Will he remain on the mountain – a shamanistic guide and teacher? Or will he descend the path to walk amongst us, warily, at The Hermit’s side? And, just the other day, I learned that I will be talking about Court Cards at the UK Tarot Conference next October – in the lunchtime slot – and a big thank you to Kim for being brave enough to give me my first chance as a Tarot speaker! There are other Tarot projects too, a couple of which have been sitting on the back burners, but with the news that The Hermit needs his light to shine, well, I might just think about giving them a stir! What about you? Did you try the spread? Hmm, seems to me you need to value yourself as a teacher a bit more, still. While I'm excited you'll be speaking at the UK Tarot Conference, it's not your first time as a tarot speaker – I remember that talk you gave on Michelle Knight's channel! 🙂 Let your wisdom shine for us all! Hello! I've been reading your blog for a while and decided to join recently, if you don't mind! DruidCraft is my first and favourite deck! I see so much of Merlin in this Hermit. For me it feels that is your ability to guide, protect and show the way to those who're not sure where they're going, shadowed and needs to get free. See my write up in Tarot Kaizen II on FB. Cool write up, as always, Ali. And such great opportunities for passing on the wisdom you've got going on. Excellent! Shine, shine! Thanks Joanne – I appreciate your kind comments!